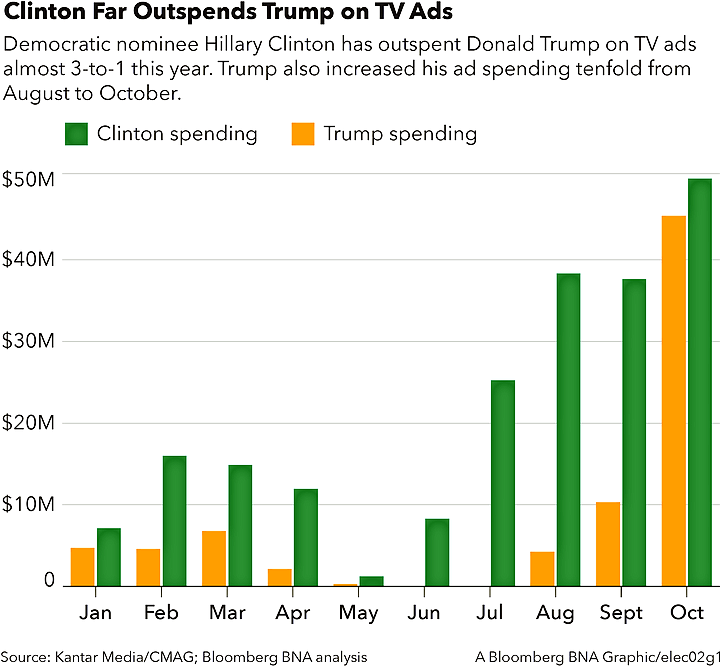 Nov. 2 — Donald Trump’s campaign ramped up spending 340 percent in October, but anti-Trump television ads still reigned supreme, according to a Bloomberg BNA analysis of Kantar Media/CMAG ad spending data. The Republican presidential candidate’s campaign poured an estimated $45.4 million into TV ads in October—up sharply from the $10.3 million the campaign spent during the previous month. Hillary Clinton’s campaign also increased its TV ad buys last month by taking out almost $50 million worth of commercials—about one-third more than the campaign spent in September. The Democrat’s presidential campaign has been buying more ads than Trump all year. The former secretary of state has spent about $210 million in TV ads since the beginning of the year, while Trump has spent less than half of that. His campaign has taken out about $78 million in ads since the start of 2016. Even though the real estate mogul’s campaign has increased its ad buys, anti-Trump ads still exceed ads in favor of the candidate. Anti-Trump ads also exceed those supporting or attacking Clinton. During the week of Oct. 25–31, anti-Trump ads accounted for more than $36 million in ad spending. Ads attacking Clinton, meanwhile, came in at about $20 million during the same week. 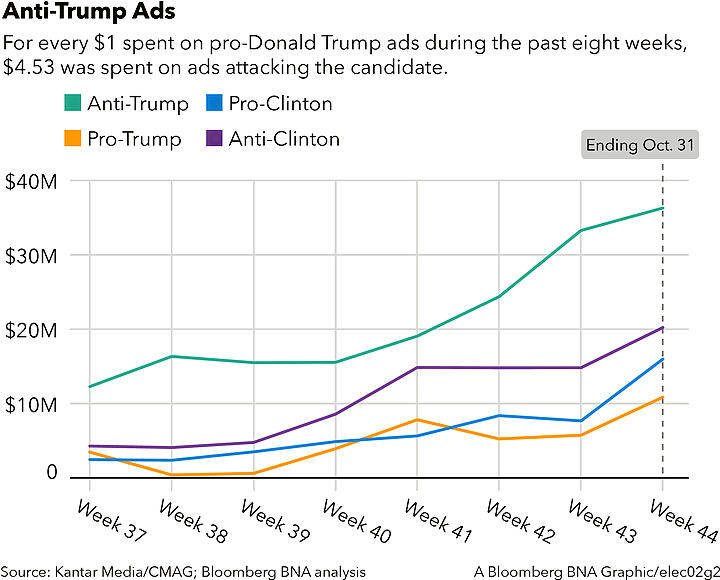 Pro-Trump ad spending was also dwarfed by the money spent in opposition to the candidate. For every $1 spent on pro-Trump ads last week, about $3.50 was spent on an anti-Trump ads. Swing states like Florida—where ads are already mostly negative—are experiencing a rise in negative TV ads as the election draws closer. Almost $10 million was spent last week on negative advertising in Florida, Ohio and Pennsylvania—up from about $4.5 million during the second week of September. Kantar Media collects data nationally on television ads and categorizes them into three tones: positive, negative and contrast. Contrast ads are a mixture of negative and positive messaging. Candidates and super PACs spent nearly three times the amount of money on negative ads than on positive ads last week in Pennsylvania, Ohio and Florida. Slightly more than 3,600 hours worth of negative ads aired last week in Pennsylvania—more than double the amount of negative ads that aired during the second week of September. Nevada has also seen a steady increase in negative TV ads, as spending on that type of ad jumped to $4 million last week from about $1.8 million eight weeks prior.